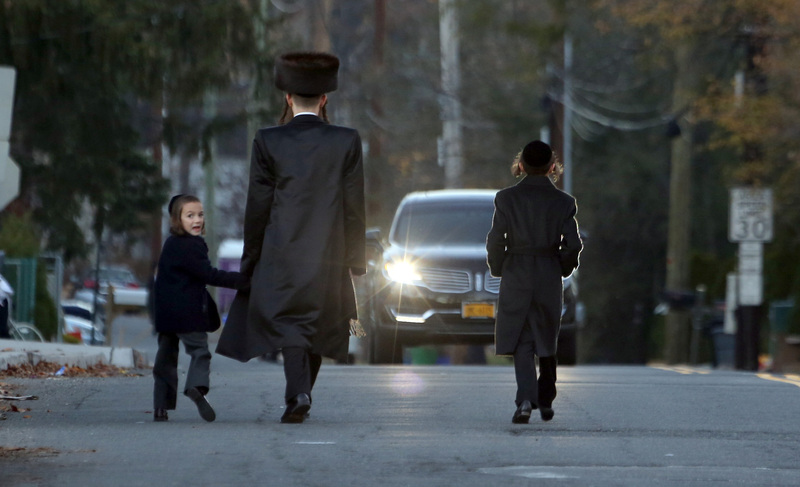 A man walks with two young boys in Ramapo, N.Y., the subject of explanatory reporting by The Journal News and lohud.com. Photo: Seth Harrison/The Journal News. This article was originally published by the Media Impact Project. Journalists don’t as a rule have a specific impact in mind when we begin our journalism. We list project goals, but other than bringing awareness to an issue or event we do not identify what we’d like to see happen next. "After years of having the same tired, angry, circular discussion, we set out — in one project — to change the conversation." This is a story about the one time we did. But here’s the real problem, and it’s not religion: Ramapo’s loose zoning, lax enforcement of fire and building codes and largely unchecked development puts everyone at risk. We wanted to know: Do people understand what’s really happening in Ramapo? If we were to explain the issue — lay it out in long-form story, year by year and decision by decision — could we all (or most of us) finally agree? Could we change minds? If we could achieve consensus, would we stop arguing religion and start attacking the real problems? So, after years of having the same tired, angry, circular discussion, we set out — in one project — to change the conversation. We researched the story over several months. We talked to longtime residents, members of the Jewish community, government officials and the county’s Fire and Emergency Services coordinator. We wrote and rewrote, shot video and mapped the region. “Ramapo nears breaking point” is a long-form piece of explanatory journalism that laid out all of the problems that began decades ago. 1. How strongly do you agree that the issues in Ramapo are a lack of zoning and safety code enforcement, not religion? 2. How strongly do you agree that after having read this story, your opinion of the issues in Ramapo has changed? 1. How have Ramapo’s issues impacted you? We built the survey using PollDaddy because it prevents repeat responses and for the data it provides on the back end, including geolocation, a time/date stamp and referrer, and it assigns each respondent a unique PollDaddy ID. This helped us connect their answers from question 1 to question 2, and so on, and get a more complete picture of their response. Could we change minds? Yes. Of those 67 percent, 14 percent said our reporting convinced them, while 35 percent said they agreed beforehand. Finally, we believed we and the community could stop having the same conversation and instead move forward toward solutions. Emails. Almost a third — 29 percent — gave us their email address for follow-up. Sources and commentary. Even more surprising than the total number of respondents was the percentage of them — 38 percent — who also took the time to write about how Ramapo’s issues have impacted them. Hearing from homeowners, those who’ve moved away, educators, fire safety officials, people who have tried to move in but claim to have been denied housing gave us a list of future story ideas and sources. People will answer a survey, even at the bottom of a long-form story, if they’re invested enough in the issue. Think about who you want to answer the survey and who you don’t. Burying our survey at the bottom of the long-form story and not promoting it weeded out casual readers that we didn’t want filling it out anyway. Close the feedback loop. Thank your readers and share the results of the survey. We didn’t do this at first, and our audience let us know that wasn’t OK.
Be upfront about how you’ll use their specific information. Unless you’re clear you will use their comments in a follow-up story, contact people to ask permission before publishing their words. This demonstrates respect and encourages further engagement. Use all of the information you gather to learn more about the audience. We cross-checked our survey email list with our subscriber lists and the list of those who attended our project discussion in person to see who we’d reached. We learned that we have room to grow our subscriber base in Rockland when we otherwise would have thought we were talking to existing subscribers. Anjanette Delgado is the digital director and head of audience for lohud.com and poughkeepsiejournal.com, part of the USA Today Network. Email: [email protected], Twitter: @anjdelgado. Special thanks to Lindsay Green-Barber of the Impact Architects, who helped with survey methodology.